In the United States, dairy farming is a booming business. That has more to do with the amount of dairy farms in the country than the price of a gallon of milk, but nevertheless dairy farming can be a worthwhile and rewarding venture for experienced farmers and newcomers to the business alike. The fact of the matter is, milk (and dairy product in general) isn’t going anywhere. Our society is going to keep on drinking it for the foreseeable future, which means the dairy business is a stable market with the potential for great returns. In 2016 alone, milk production in the United States rose to its highest amount ever, with nearly 215 million pounds being produced according to the United States Department of Agriculture. That’s a whole lot of creamy, delicious milk. So, if you’re looking to get into this business, read on for some tips before you get started. And if you’re looking for agricultural development in Greeley, or anywhere throughout Colorado, Kansas, Montana, Nebraska, New Mexico, South Dakota, or Wyoming, the experts at AGPROfessionals can help. Contact AGPROfessionals today to learn more about our agricultural development services, from financial planning to structural engineering to surveying and geotechnical services. 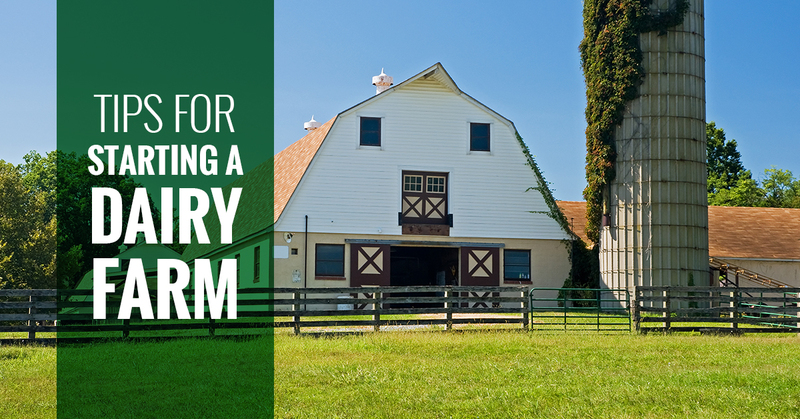 Here’s what you should know before starting a dairy farm. Like any new business venture, you need to carefully plan out every little detail you can think of when it comes to your dairy farm. From the location to the budget to the marketing to the size of your operation, you need to know the strengths and weaknesses of your business overall so that you can set and maintain reasonable expectations. Yes, there is more than one type of cow. You need to know which type of dairy cattle you want to raise on your farm. It’s wise to choose one that is capable of producing large quantities of milk with the proper proteins and nutrients, which is why Holstein cows make up nine out of every 10 dairy cows in the United States. Your cows are going to need the right type and mixture of food and nutrients in order to properly support themselves, produce milk, and ultimately produce more cattle. If you have the space and resources on your farmland, you can opt to let them graze the crops you grow on site. Otherwise, it’s important to work with neighbors or other businesses to get the proper feed for your herd. Just as cows need to eat, they also need to dispose of their nutrients. Cows are known for creating a large amount of manure, and knowing what you’re going to do with it all can help you reach peak efficiency. Learn how to re-use the manure as a resource for crop growth, compost, or even selling it to recoup some money. We had a full blog talking about the benefits of building a proper barn for your dairy, but the biggest takeaway from that is your barn can be used to maximize the efficiency of your barn and maintain the overall health of your cattle. Take proper measurements and spend adequate time and resources on its construction, as this is where you and your cattle will be spending a considerable amount of time during the milking process. Talking to an expert agricultural developer can help expedite the entire process, from buying farmland to planning your site and maximizing efficiency. Contact AGPROfessionals today to learn more.